What can you do for €60 in Paris? I don’t normally work with companies promoting services on this blog, but I recently received a challenge that I thought would be genuinely interesting in connection to a service that seemed particularly useful to travellers. 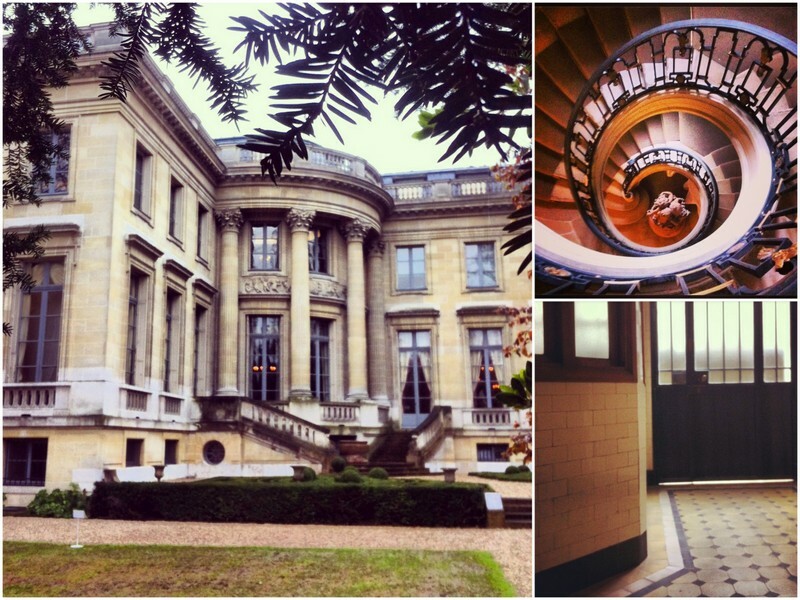 The challenge came from WeSwap*, who asked how I would spend £50 in one day in Paris. Obviously it's pretty easy to spend that amount of money very quickly in the French capital, but the challenge was rather to see just how much I could do with that sum. Very briefly (more detailed description at the end - including some free money! ), WeSwap is a social currency service that enables travellers to exchange money between themselves without the need to go through banks. WeSwap credited my account with £50, which I actually swapped before the Brexit vote, meaning I got a now generous looking €64.25 for my £50. Given that withdrawing money from a cash dispenser is charged at €1.75 (although this fee is waived if you withdraw €200 or more), I have rounded this down to €60 for the purpose of this challenge. So what did I do with €60? A mix of history, culture and sport, with a little bit of food and drink to keep me going! Although I love walking in Paris, this challenge required a bit more speed and I genuinely believe that Paris is a great city to cycle too. It’s possible that the WeSwap card will work at the city’s Velib terminals, but I can’t confirm this. In any case, rather than use this ‘free’ service (you’ll be charged €1.70 for one day using the system, with unlimited use of bikes for a maximum of 30 minutes each time) I prefer to rent a bike for the day. Velibs are great, but you can often be stuck trying to locate bikes in certain areas, or spend time circling a zone to find a free slot to return the bike. The bikes are also of varying quality, and it can be irritating to cycle along with a bike that squeaks, slips gear or veers off in strange directions. I rent my bikes at the strangely named Toys Paradise on the Canal Saint Martin near République, but it’s possible to find similar places across the city. For €10 you get a decent bike for the day and a heavy duty lock. There’s only one limitation – you have to get it back by 7pm at the latest! Now on wheels, I whizzed across to this museum on the edge of the Parc Monceau which is one of my favourites in Paris. It’s not so much for what is on display, but rather for the story it tells and for its atmosphere. Several museums in the city are housed in the mansions of wealthy donators and benefactors, but only the musée Nissim de Camondo has stayed almost exactly as it was when the family left. This means you get to see the servants’ quarters and an impressive kitchen on the ground floor, and even the personal bathroom and toilet of the owner of the house. Handed over to the musée des Arts décoratifs in the 1930s ostensibly because the owner (Moise de Camondo – a Jewish immigrant from Istanbul) was a great collector of porcelain and 18th century art, the house is also a monument to a tragic family. The home gradually and subtly unveils the story of a man who lost a wife (who left him), his adored son in WW1, then after his death, his daughter and grandchildren at Nazi concentration camps. This combination of beauty and tragedy makes for a moving visit, and often one you can experience almost alone! The €9 entrance fee includes a very informative audioguide. Note that for an extra €4 you can also visit the Musée des Arts décoratifs in the Louvre. Time for refreshments. I headed to the Marché des Enfants Rouges in the north of the Marais (a bit of a detour, but I had something else to do) which has the advantage of offering a wide choice of food and drink at good prices and a little bit of atmosphere. It remains a market in name, but in reality it is more a selection of good quality fast-food stands, offering everything from Japanese bentos to organic salads. I took a stool at the Lebanese traiteur for a sandwich, fruit cocktail and pastry. A ticket to see the city’s biggest football team, Paris Saint Germain – would use up most if not all of the budget for this challenge. Luckily there is now another club in town offering a more genuine experience at a fraction of the cost! 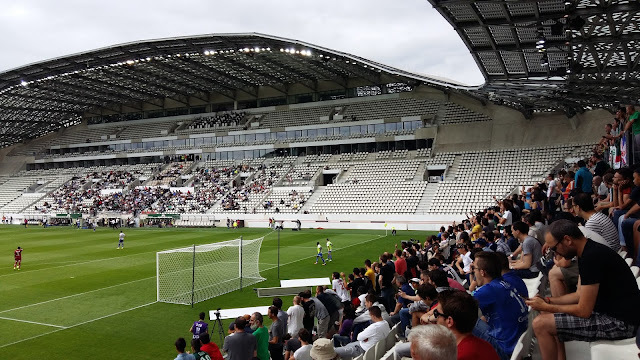 Red Star is the second oldest football club in France, and although their real home is in the northern suburb of Saint Ouen, the dilapidated nature of that stadium has meant that they have needed to look elsewhere to host their matches. This year this means the Stade Jean Bouin, just alongside PSG’s Parc des Princes, and normally home to the Stade Français rugby team. Red Star currently play in the country’s second division, but the standard of football is competitive. Better still, are the supporters, politically from the far-left and genuinely concerned with keeping prices low and inclusion high. They also generate quite an atmosphere during games, even if the city’s chic 16th arrondissement is not their natural environment! Football matches here will generally be on Friday evenings, but several games should also take place on Saturday at 3pm. The cheapest tickets – at €10 – are also the best, behind the goal with the colourful Red Star supporters. Given its position on the Place de la Concorde and inside the Jardin des Tuileries, the Jeu de Paume is a surprisingly modest and intimate gallery space. It could be expected that such a well-placed exhibition space would concentrate only on crowd pleasers, but the selections are consistently high and challenging. Then again, the Jeu de Paume has always been amongst the avant garde - originally built as a court for a game that was a precursor to tennis, it became at the beginning of the 20th century the first space to display art in a building not designed for that purpose. 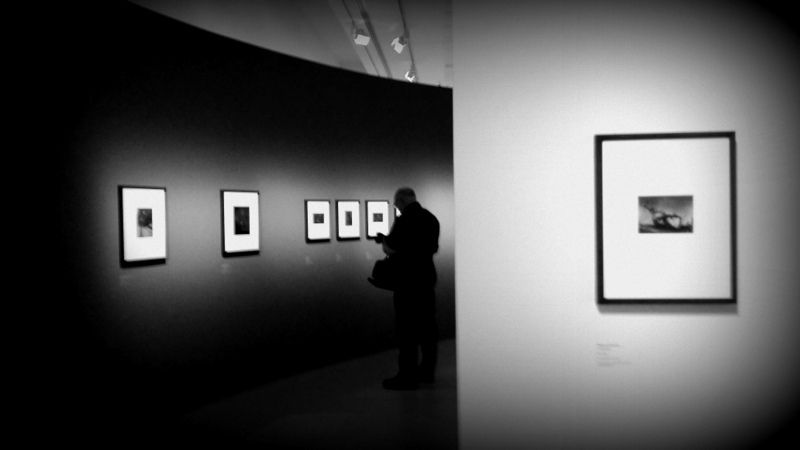 Today it concentrates on film, photography and video, and you'll often get several exhibitions for the price of one, which was the case for me. I went to see the humble, poignant and luminous work of one of my favourite photographers, Josef Sudek, but was happy to also discover the work of Lebanese artists Joana Hadjithomas and Khalil Joreige and the political pop-art films of Guan Xiao. Returning the bike after quite a few kilometres in the saddle, it's time for a little relaxation. 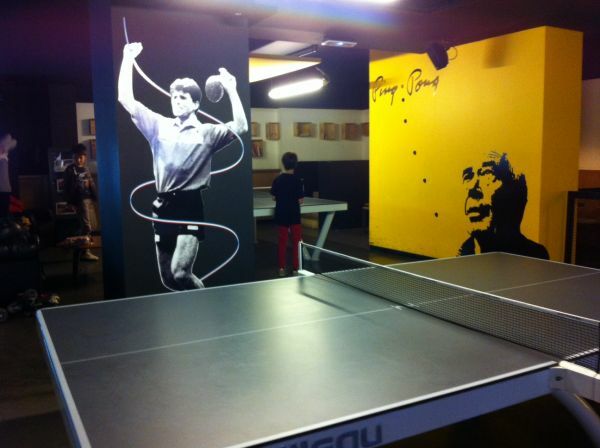 I'm not one to sit still though much, so Gossima - the city's first ping pong bar - is a good option. Housed over two levels in a converted garage (and an annexed hairdressing salon!) it offers a bar and around 10 tables. As you need to be at least two to play, this time I shared the costs (30 minutes + a drink)! With just a few Euros left to spend I decided to go nearly next door, to the Fine Mousse, Paris's best bar for beer! Craft beer has been something of a growth industry in France recently, and from a position of nearly zero production 10 years ago, now dozens of micro-breweries can be found across the country, many of which are in the Paris area. With 20 beers on tap, the Fine Mousse always has a good selection of these on offer. Note that for €14 you can get a generous plate of meat and cheese to accompany your beer. If you're feeling a little more hungry, there is also a Fine Mousse restaurant serving tapas-style dishes that are designed to marry perfectly with craft beers! WeSwap is a social currency app that enables you to exchange your currency directly with other travellers, meaning the fairest rates for everyone and no bank charges or hidden fees. After signing up for the service, you will be sent a WeSwap Mastercard which you can load with your own currency via the app. When you plan to travel somewhere, use the app again to find swappers in that destination. The card then holds that currency, which you can use either as a system of payment or to withdraw cash. Click here to find out more and for a £5 credit on your account thanks to Invisible Paris! Love your suggestions! I rented a bike, it was a great way to see Paris. Love your photos! :) here is my recent trip to Paris :) http://www.richtrek.com/2016/08/a-look-taste-feel-of-romantic-paris.html hope it adds! Would happily spend whole 60 to watch Paris Saint Germain live! But now when Zlatan has moved, I doubt I will. For me it would be better to stay away from football, when I visit Paris later this year, but rest of the suggestions would definitely help, thanks! Interesting article... 60 euros in Paris is really nothing but this does create some perspective! As Shannon said - PSG for 60 euros? I'm in!